A neuroma is a painful condition often referred to as a pinched nerve, swollen nerve or nerve tumour. Anything that compresses (pinches) or irritates a nerve can lead to a neuroma. It can happen in various parts of your body. 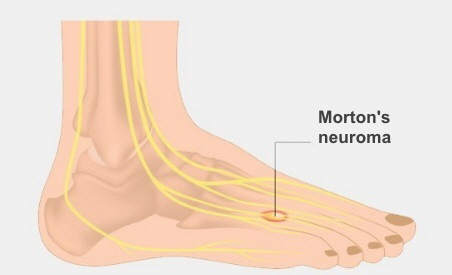 The most common neuroma in the foot is a Morton's neuroma, which happens at the base of your third and fourth toes. This causes pain, burning, tingling or numbness between your toes and in the ball of your foot. People with certain foot deformities such as bunions, hammertoes, flat feet, or more flexible feet, are much more likely to develop a neuroma. They are also more likely to happen if you have injured your foot, or there's some other type of damage. If you suspect you have a neuroma, it's important to get it diagnosed early, as you may be able to avoid more invasive treatments, including surgery. a feeling that something is inside the ball of your foot, or that there's a lump in the shoe, or your sock is bunched up. use shoe inserts or orthotics prescribed by a podiatrist. The treatment will differ according to how severe your neuroma is. A podiatrist can advise you and provide the treatment that will work best for you. You can find a podiatrist by searching on Podiatry NZ's website. If these nonsurgical treatments don't help, you may benefit from surgery to release (decompress) or remove the affected nerve. Written by Podiatry NZ. Adapted by HealthInfo clinical advisers. Page created February 2016.